Cycled up to Chalet Reynard for a coffee. Continued to the top and came back down again. 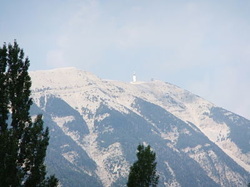 Aspiring to reach the top of Mont Ventoux, John suggested that we plan the attempt at the end of a three week tour in southern France, when we should be either exhausted or at the peak of our fitness. Unsure whether anyone had ever taken a recumbent tandem trike like ours up the mountain, which Lance Armstrong described as the worst mountain in the world, we decided that the disadvantage of its size and weight might be counteracted by our three wheels, which would mean we should not fall off, whatever else we did. Because of the varying weather conditions that can be experienced at the top, we left three days to choose from at the end of our tour, and on our return consulted the tourist office in Sault for a weather forecast. The next day promised the best weather, so at 6.40 a.m. we set off, armed with plenty of water, fig biscuits and dried apricots, as well as extra clothing for cooler temperatures at the top, a spare tyre, inner tubes, tool kit and pump. Taking the route from Sault means the longest ride, but also initially the less steep gradients, and the twenty kilometres to Chalet Reynard at the tree line passed without incident in the middle ring, although the road surfaces were dreadful. The Tour de France does not take this route, so there is no incentive to resurface the road. We were passed by few bikes, but half a dozen did zoom by wearing shirts of the Legion Etrangère, the Foreign Legion, which turns out to have a base nearby. The mainly French and Belgian cyclists who passed us on the road later were mainly on light sportif models with a tiny pump and inner tube in their back pocket, although we did see a few mountain bikes. 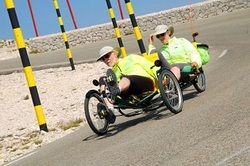 We hoped that the sight of two English pensioners chatting together as they pedalled their tandem trike up the mountain did not detract from their own feelings of ‘sportive’ achievement. At least I wasn’t knitting. At Chalet Reynard we paused for a coffee (but no pain au raisins to John’s distress) and watched as riders coming up from Bedoin, a steeper route, swung round the hairpin in front of us without stopping and then began to struggle as the gradient increased sharply. One Belgian man who came over to ask about the trike told us that his son was doing the mountain five times that day, once from each starting town – Sault, Bedoin and Malaucene - on his road bike and twice on mountain bike routes. When we set off again, John engaged our small ring and we wound our way steadily up the 7% and 8% gradients and hairpin bends of the last six kilometres. The trike attracted many photos, as it always does, and when we stopped at one point to take in the view and a drink of water, a kind Dutchman took a photo of us on our camera. Even the final tight corner and steep pull up of a hundred metres to the summit ramp did not bring us down to our lowest gear of all, and we were agreeably surprised to find that we were not heaving for breath and pouring with sweat like some of the upright solo riders, especially those who had made the most difficult ascent from Malaucene on the other side of the mountain. 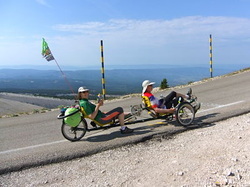 We welcomed offers to photo us both with the trike, succumbed to purchasing a pair of Mont Ventoux socks and hung around at the top for quite a while. But space is limited up there and having admired the spectacular 360 degree views, we felt we should set off down to make room for those still arriving every minute. It is a very popular ride indeed, and the support cars of Belgian and French families make the top a busy place. Descending steep hairpins on the trike is an unnerving experience, and involves John hanging out to the side to keep the front nearside wheel on the road and me just hanging on tight to stay on board. It feels much faster than it really is, but looks spectacular. We were overtaken all the way down by solo cyclists pedalling as though they were in the Tour de France, although a few then stopped to take our photo before setting off again. There were still many cyclists of all ages plodding uphill on their way to the summit, and we felt very sorry for them as the heat increased steadily as we descended, taking in crêpes at the Chalet Reynard café en route. Our ascent took three and half hours pedalling time and the descent about half an hour. We climbed (and descended) four thousand feet, the summit being at 6,273 feet.